The DA will hand over a six-page memorandum to Parliament's watchdog public accounts committee (Scopa) chairperson Themba Godi, which "raises some serious questions about the controversial decision to close the investigation into the multibillion-rand arms deal", Democratic Alliance MP David Manier said on Sunday. "The memorandum was drafted by General Hans Meiring, divisional commissioner responsible for commercial crime in the Hawks, and was obtained as a result of a request, in terms of the Promotion of Access to Information Act, for documents relating to the decision to close the investigation into the arms deal," he said in a statement. The memorandum recommended that Hawks head Anwa Dramat close the investigation into British Aerospace (now known as BAE Systems) and the German Frigate Consortium (GFC) legs of the arms deal. Manier said the memorandum was "poorly drafted, and contained a number of contctions and errors of fact". It is highly superficial when measured against the gravity of the decision. The memo does not refer to any specific suspects, witnesses, dates or evidence. Meiring’s grasp of the facts is tenuous. He calls BAE Systems "British Eurospace", presumably after its former name, British Aerospace. His claim that "the transactions relating to [the BAE] investigation refer back to the mid nineteens" [presumably mid-1990s], omits that the arms contracts were signed in December 1999 only and that allegedly corrupt payments flowed until at least 2007. Meiring complains about the difficulty of getting foreign evidence, such as financial flows and company documents, while acknowledging that such information was already in the Hawks's possession after foreign investigators had shared it informally. Although the evidentiary value of informally obtained evidence is decreased, the evidence is known and formal channels remain potentially available. Meiring complains about the difficulty of obtaining evidence after years have passed, while admitting the existence of about 4.7-million pages of documents, secured in a 2008 raid on BAE, Hlongwane and others. But this trove he turns into another negative, on the basis that it would require further effort to "peruse and analyse". Meiring argues, contradictorily, that although "cost implications to conduct an investigation cannot be a consideration … it should not be ignored". He also complains that "a team of dedicate[d] investigators and prosecutors would be required" -- although the appointment of such teams is presumably standard in important, complex cases. Meiring claims that "the three suspects in the BAE leg have all passed away". Joe Modise, defence minister during the period of arms procurement, and Richard Charter, one of BAE's local agents, have both died, but the identity of the third suspect is a mystery. Certainly, Fana Hlongwane -- who was regarded as a suspect because he could have influenced the deal as Modise's adviser and subsequently received more than R200-million in payments from BAE and its partners -- is alive and well. Meiring claims there is "no prima facie evidence against any person" in the BAE matter, even though a South African judge confirmed an offshore freeze on Hlongwane's funds as the "proceeds of crime". Although he has denied wrongdoing, Hlongwane has not denied receiving payments from BAE. 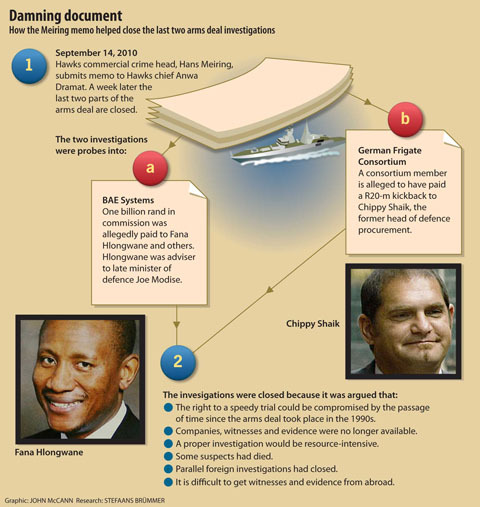 Meiring dismisses the entire GFC investigation involving Chippy Shaik -- then head of defence procurement-- in three paragraphs tacked on to the end of the document, claiming that "the reason mentioned in the BAE case is also applicable to the German Frigate Consortium case". This flies in the face of firm evidence. "It is hard to believe that this memorandum, riddled with contradictions and factual errors, formed the basis of the decision to close the investigation into the arms deal," said Manier on Sunday. "General Anwa Dramat has, for more than six months, resisted the request to provide an update in 'exhaustive detail' on the status of the investigation into the arms deal to Scopa. "Evidently, General Dramat and the Hawks think they are beyond scrutiny and oversight by Parliament. The memorandum will hopefully provide a sufficient basis for summoning General Dramat and the Hawks to appear before Scopa." Manier said the DA would therefore provide a copy of the memorandum to Godi and call on him to summon Dramat to appear before Scopa to explain the decision to close the investigation into the arms deal. With acknowledgements to Sapa and Mail and Guardian.